The Aussie anthem plays at the German Grand Prix for a victorious Mark Webber. After eight long years and 130 starts in F1, where he has earned the moniker of the unluckiest man in motorsport, Mark Webber has cracked both a pole and a win in the one weekend at the Nurburgring in Germany. It's the first time the Aussie anthem has played since Alan Jones took out the US Grand Prix in 1981. Creeping up as high as second place this year (to team mate Vettel), Webber was well overdue for the win, and a first-time pole position on Saturday gave indication that his luck may be changing. Coming into Turn 1, however, it almost fell apart. Contact with Rubens Barrichello was a borderline fault, but the stewards decided to penalise Webber with a drive through penalty. Relinquishing second place to amble through the pits seemed to fire up the Aussie even further, and with the unintentional help of Felippe Massa, who blocked Barrichello's charge, Webber gained two seconds a lap on the leaders and crawled back to the front of the field. Ironically, Barrichello pitted on lap 32 just as Webber caught up, leaving him a clear track and plenty of fresh air. 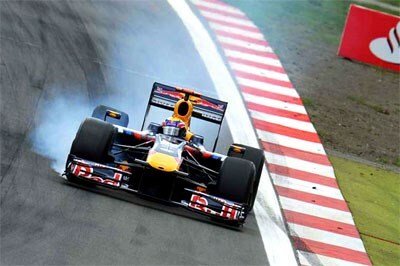 With team mate Vettel defensively in second place a further nine seconds back, Webber crossed the line in front of his father and a jubilant Red Bull garage. Tuning in to the team radio, Webber could be heard to scream repeatedly - relief and jubilation after eight years of supreme effort. "It's an incredible day," Webber said after the race. "I wanted to win so badly after Silverstone, as I thought I had a good chance there, then after yesterday's pole I knew I was in a good position to try and win the race today. "It was a difficult winter, Sebastian showed in winter testing what the car could do, so that kept my motivation very high when I was hurting a lot with all the rehab (from a cycling accident in Tasmania before the 09 season)". "I had great people around me to recover from all the injuries I had and the team have been incredibly patient with me as well. "It's just an incredible day for all the people who have helped me get to where I am today.